Aloe (also written Aloë) is any member of the flowering plant genus Aloe, comprising about 400 species of succulent, perennial plants, most of which have a rosette of serrated leaves at the base but no or little stem. The genus is native to Africa and is common in South Africa's Cape Province and the mountains of tropical Africa, and neighboring areas such as Madagascar, the Arabian peninsula, and the islands off Africa. Today, it is widely grown in warmer climates globally, and indoors. Human prosperity and well-being is tied to its relationship with its natural environment. One of the key contributions of plants historically has been as a source of medicine. Aloe plants, such as Aloe vera and Aloe chinensis, has been used for thousands of years for medical reasons. In particular, Aloe vera ("true aloe") has been popular for treatment of dermatological conditions and as an ingredient in cosmetics. Aloe also contributes to the quality of human life through their use as ornamental plants. 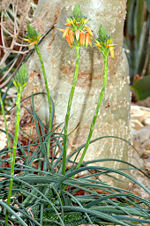 Most aloes have a rosette of large, thick, fleshy leaves. The leaves are often lance-shaped with a sharp apex and a spiny margin. Aloe flowers are tubular, frequently yellow, orange, or red and are borne on densely clustered, simple, or branched leafless stems. 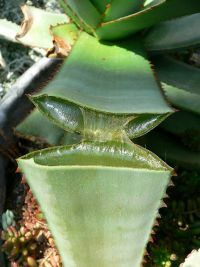 Many species of aloe are seemingly stemless, with the rosette growing directly at ground level. Other varieties may have a branched or unbranched stem from which the fleshy leaves spring. They vary in color from gray to bright green and are sometimes striped or mottled. 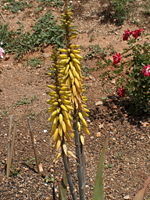 The APG II system (2003) placed the genus Aloe in the family Asphodelaceae. In the past, it has also been assigned to the lily family (Liliaceae) or the family Aloaceae. 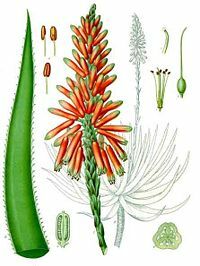 Members of the closely allied genera Gasteria, Haworthia, and Kniphofia, which have a similar mode of growth, are also popularly known as aloes. Aloe vera-Barbados Aloe, Common Aloe, Yellow Aloe, Medicinal Aloe. This is the variety popular medicinally. Note that the plant sometimes called "American aloe" (Agave americana) belongs to Agavaceae, a different family. Some consider the aloes and agaves justifiably to be placed in the same family. Various biologically active substances are found in diverse aloe species. One biologically active substance contained in the juice of aloe leaves is [aloin]]. Aloin is one of a group of chemicals known as anthraquinones. Other anthraquinones found in aloe leaves include barbaloin, aloe-emodin, and aloectic acid (Longe 2005). The laxative effect of aloes is largely attributed to this group of chemicals. Aloins are soluble and easily extracted by water. When the leaves are cut, the juice that flows out is collected and evaporated. After the juice has been removed, the leaves are sometimes boiled, to yield an inferior kind of aloins. Another biological active component found in Aloe vera is acetylated mannose, or acemannan, a polysaccharide (Longe 2005). This substance has been considered to be effective in stimulating the immune system, including activities against the viruses causing the flu, measels, and AIDS, as well as effectiveness against some veterinary cancers (Longe 2005). Prostaglandins are also found in Aloe vera and are considered to be involved in wound healing (Longe 2005). Aloe vera (syn. A. barbadensis Mill., A. vulgaris Lam.) is a species of Aloe that is particularly popular for its medicinal properties. Aloe vera is a stemless or very short-stemmed succulent plant growing to 80-100 cm tall, spreading by offsets and root sprouts. The leaves are lanceolate (lance-shaped; long, wider in the middle), thick and fleshy, green to gray-green, with a serrated margin. The flowers are produced on a long spike (stalk) up to 90 cm tall, each flower pendulous, with a yellow tubular corolla 2-3 cm long. A. vera has a long history of cultivation throughout the drier tropical and subtropical regions of the world, both as an ornamental plant and for herbal medicine. The lower leaf of the plant is used for medicinal purposes. If the lower leaf is sliced open, the gel obtained can be applied on the affected area. Leaves and seeds are the two edible parts of Aloe vera. Aloe vera is relatively easy to care for in cultivation in frost-free climates. The species requires well-drained sandy potting soil in moderate light. If planted in a pot or other container, it is important to ensure sufficient drainage with drainage holes. The use of a good quality commercial potting mix to which extra perlite, granite grit, or coarse sand are added is recommended. Alternatively, pre-packaged "cacti and succulent mixes" may also be used. Potted plants should be allowed to completely dry prior to re-watering. During winter, A. vera may become dormant, during which little moisture is required. In areas that receive frost or snow, the species is best kept indoors or in heated glasshouses. Aloe vera is also known as Aloe vulgaris ("common aloe") and as Aloe barbadensis (Longe 2005). Aloe species are frequently cultivated as ornamental plants both in gardens and in pots. Many Aloe species are highly decorative and are valued by collectors of succulents. Researchers at the University of Miguel Hernández in Alicante, Spain have developed a gel based on A. vera that prolongs the conservation of fresh produce, such as fresh fruit and legumes. This gel is tasteless, colorless, and odorless. This natural product is considered a safe and environmentally friendly alternative to synthetic preservatives such as sulfur dioxide. The study showed that grapes at 1°C coated with this gel could be preserved for 35 days against 7 days for untreated grapes (Serrano et al. 2006). According to the researchers, this gel operates through a combination of mechanics forming a protective layer against the oxygen and moisture of the air and inhibiting, through its various antibiotic and antifungal compounds, the action of microorganisms that cause food borne illnesses. Aloe is used in treating skin conditions, alternative medicines, and in home first aid. 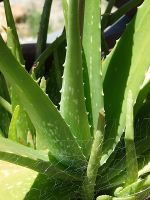 Both the translucent inner pulp as well as the resinous yellow exudate from wounding the Aloe plant is used externally to relieve skin discomforts and internally as a laxative. Aloe vera has been particularly popular for its medical use. It use is mentioned in records as early as 1750 B.C.E., and the finding of drawings of Aloe vera on cave walls in Egypt may reflect its use in Egyptian embalming procedures (Longe 2005). Pliny and Dioscorides of ancient Greece wrote of its healing effects, and legend traces its use as one of Cleopatra's secrets for keeping her skin soft, and that Alexander the Great acquired Madagascar so that he could utilize the native Aloe vera for treating soldier's wounds (Longe 2005). In the mid-1930s, Aloe vera leaf gel was used successfully in the treatment of a women with chronic and severe dermatitis resulting from x-ray treatments, and this fostered additional trials with others receiving radiation burns (Longe 2005). There remains little human research data delineating the effectiveness of Aloe vera treatment, but successful studies have been carried out on animals, including a 1953 study by Lushbaugh and Hale on rats (Longe 2005). Effectiveness on humans remains largely based on anecdotal evidence. The University of Maryland Medical Center (2006) notes that aloe was one of the most frequently prescribed medicines during the eighteenth and nineteenth centuries and that it remains today one of the most commonly used herbs in the United States. Aloe vera has been used externally to treat various skin conditions, such as cuts, burns, and eczema, as well as sunburn, dermatitis, insect stings, poison ivy, abrasions, and other dermatological conditions. It is alleged that sap from Aloe vera eases pain and reduces inflammation. It is held that components such as several glycoproteins and salicylates are anti-inflammatory, and there are substances that stimulate growth of skin and connective tissue, as well as various vitamins and minerals (vitamin C, vitamin E, and zinc) and antifungal and antibacterial components (Longe 2005). Aloe vera's activity is also attributed to moisturizing and pain relieving properties (Longe 2005). Evidence on the effects of A. vera sap on wound healing, however, is contradictory (Vogler and Ernst 1999). A study performed in the 1990s showed that the healing time of a moderate to severe burn was reduced when the wound was treated on a regular basis with Aloe vera gel, compared to the healing of the wound covered in a gauze bandage (Farrar 2005). 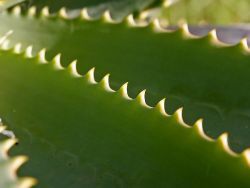 In contrast, another study suggested wounds to which Aloe vera gel was applied were significantly slower to heal (Schmidt and Greenspoon 1991). Cosmetic companies add sap or other derivatives from A. vera to products such as makeup, moisturizers, soaps, sunscreens, shampoos, and lotions, though the effectiveness of Aloe vera in these products remains unknown. A. vera gel is also alleged to be useful for dry skin conditions, especially eczema around the eyes and sensitive facial skin. An article published in the British Journal of General Practice suggests that A. vera is effective at treating athlete's foot. The topical application of A. vera is not considered an effective preventative for radiation-induced injuries. The clinical effectiveness of oral or topical A. vera remains unclear at present. Some Aloe species have also been used for human consumption. For example, drinks made from or containing chunks of aloe pulp are popular in Asia as commercial beverages and as a tea additive; this is especially true in Korea. Aloe contains a number of medicinal substances used as a laxative and purgative. The medicinal substance is produced from various species of aloe, such as A. vera, A. socotrina, A. chinensis, and A. perryi. Several kinds of aloes are commercially available: Barbadoes, Socotrine, Hepatic, Indian, and Cape aloes. Longe (2005) states that Aloe vera products taken internally should not contain the laxative chemicals found in the latex layer. The University of Maryland Medical Center (2006) notes that oral use of aloe for constipation is not recommended because of severe side effects. An injectable form of acemannan manufactured and marketed by Carrington Laboratories as Acemannan Immunostimulant™ has been approved in the United States for treatment of fibrosarcoma (a type of cancer) in dogs and cats after clinical trials. Some tumor shrinkage has been found in experimental studies on dogs and cats with this product (King et al. 1995). It has not been approved for use by humans, and its sale is controlled and it can only be obtained through a veterinary doctor. Aloe Vera juice is alleged to help some people with ulcerative colitis, an inflammatory bowel disease. In homeopathic medicine, aloe is used for hemorrhoids (Morrison 1993). Aloe has been marketed as a remedy for coughs, wounds, ulcers, gastritis, diabetes, cancer, headaches, arthritis, immune-system deficiencies, and many other conditions when taken internally. Longe (2005) states that there is some evidence that Aloe vera juice has a beneficial impact on peptic ulcers, perhaps inhibiting the causative bacteria or having a soothing effect on the ulcer. However, in general, these internal uses are unsubstantiated; the only substantiated internal use is as a laxative. Furthermore, there is evidence of potential adverse side effects (for example, acute hepatitis) (Rabe et al. 2005). Although some studies suggest that certain components of aloe such as aloe-emodin have genotoxic activity, human clinical trials and rodent carcinogenicity studies do not substantiate a genotoxic risk to humans when aloe products are consumed as directed (Brusick and Mengs 1997). There have been very few properly conducted studies about possible benefits of aloe gel taken internally. One study found improved wound healing in mice. Another found a positive effect of lowering risk factors in patients with heart disease. Some research has shown decreasing fasting blood sugar in diabetic animals given aloe. There are studies involving oral extract used by patients with asthma who are not steroid dependent that show some evidence of improved symptoms (Longe 2005). None of these studies, however, can be considered to be definitive, and there are many false advertising claims for aloe. On May 9, 2002, the U.S. Food and Drug Administration issued a ruling banning the use of aloe and cascara sagrada as laxative ingredients in over-the-counter drug products (Bayne 2002). The juice of the leaves of certain species, such as Aloe venenosa, is poisonous. Bayne, H. J. 2002. FDA issues final rule banning use of aloe and cascara sagrada in OTC drug products. HerbalGram 56: 56. American Botanical Council. Retrieved May 3, 2007. Brusick, D. and U. Mengs. 1997. Assessment of the genotoxic risk from laxative senna products. Environ Mol Mutagen 29(1): 1-9. Craig, W. 2001. The all-purpose gel. Vibrant Life July 2001. Farrar, M. M. 2005. Skin deep. Better Nutrition July 2005.
International Aloe Science Council. 2002. The complete story of Aloe vera. International Aloe Science Council. Retrieved May 3, 2007. King, G. K., K. M. Yates, P. G. Greenlee, K. R. Pierce, C. R. Ford, B. H. McAnalley, and I. R. Tizard. 1995. The effect of Acemannan Immunostimulant in combination with surgery and radiation therapy on spontaneous canine and feline fibrosarcomas. Journal of the American Animal Hospital Association 31(5): 439-447. Retrieved May 3, 2007. Morrison, R. 1993. Desktop Guide to Keynotes and Comfirmatory Symptoms. Grass Valley, CA: Hahnemann Clinic Publishing. ISBN 096353680X. Rabe, C., A. Musch, P. Schirmacher, W. Kruis, and R. Hoffmann. 2005. Acute hepatitis induced by an Aloe vera preparation: a case report. World J Gastroenterol 11(2): 303-4. Retrieved May 3, 2007. Ramamoorthy, L., and I. R. Tizard. 1998. Induction of apoptosis in a macrophage cell line RAW 264.7 by Acemannan, a -(1,4)-acetylated mannan. Molecular pharmacology 53(3): 415-421. Retrieved May 3, 2007. Serrano, M., J. M. Valverde, F. Guillen, S. Castillo, D. Martinez-Romero, and D. Valero. 2006. Use of Aloe vera gel coating preserves the functional properties of table grapes. J Agric Food Chem 54(11): 3882-3886. Schmidt, J. M., and J. S. Greenspoon. 1991. Aloe vera dermal wound gel is associated with a delay in wound healing. Obstet Gynecol 1: 115-117. University of Maryland Medical Center (UMMC). 2006. Aloe. University of Maryland Medical Center. Retrieved May 3, 2007. Vogler, B. K., and E. Ernst. 1999. Aloe vera: a systematic review of its clinical effectiveness British Journal of General Practice 49: 823-828. This page was last modified on 7 March 2019, at 20:31.